and it's hard to keep up! Every week, something is different. Why are they doing this to us?? With all these changes, it's hard to know where to spend your time. 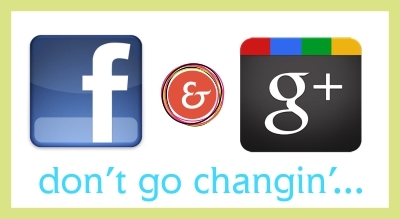 Both Facebook and Google+ are "free" ... or are they? Are you spending (wasting) your time posting and commenting all over the place and not seeing much in the way of results? Should you use a posting tool like Hootsuite to help you manage your social media time? Where should you focus your efforts? Every business is different and the answers to those questions may change... and change back. The war continues. Something's going on. Can you feel how glitchy Facebook is this week? What will be next? How will it affect you? Google+ ... ok nothing ugly about it. This is my personal profile but it would be the same dimensions for the business pages. Other than the obvious size differences, there is one BIG difference that I don't have shown here. On Facebook, you are not allowed to give your url, to use any kind of call to action, to in any way refer to LIKING or SHARING the page. No promotions or sales of any kind. On G+ you can put it ALL in your cover image if you want. You also have the option of using 110x110 images of your photos or graphics instead of one cover photo. Still looking at that same image, on G+ you'll see that I am able to navigate to my home page, circles, business page and games right from my profile page. On Facebook, your navigation menu is on your newsfeed page. On Facebook, you request people to be your friend with your personal profile. Then you can see their activity and they can see yours. To keep up to date with a business page, you LIKE that page with your personal profile and their status updates will appear in your newsfeed. Maybe. Just because you LIKE a page doesn't mean you get to see all their updates. Facebook chooses what you see based on Edgerank... and they really don't tell us how it truly works. If you get tired of seeing someone, you can add them to your "Acquaintances" If you are tired of a business in your newsfeed, you can hide them and never see anything from them again. You can create lists of people and businesses you want to keep up with. You can allow others to subscribe to those lists. Business pages can't interact with you on your profile page, they can only interact with you on their page. On G+ you add people to your circles. You can add anyone. You can make as many circles as you want: family, friends, business contacts, the volleyball team, babysitters... and you can add people to as many circles as you want. You can follow business pages. Those business pages can also be added into your circles. When you circle a business, that business can then follow you as well. Which means businesses can interact with you on your page as well as theirs. You can create a circle of people/businesses that you might want to hear less from. G+ has a slider tool to tone down the number of posts you see from these people. You can also send posts to specific circles. You can share your circles with others. On comments and posts, it pretty much means the same thing. On the rest of the internet though, if you +1 a website or blog post or video or anything, you can find it in your profile so you can go back to it. It's like a bookmark. When you +1 something, you also have the option of posting it to your G+ feed but you don't have to. There are loads more differences but this post would be incredibly long if I mentioned everything. G+ also has hangouts (video chat) and trending topics (# like on twitter). Only you know if your business will convert on G+, you're the one that needs to make the effort. Get yourself established on G+ and give it a shot.... a real shot. Not just a half completed profile and a few posts. Put it in your schedule and test it out. To be clear, I'm not saying you need to dump Facebook. I'm saying utilize both and keep your options open. Need some help getting set up? I have my very first eBook coming out on May 1st... G+ Tutorial. (YAY!) I'll be sending out an update and the specifics on that later in the week. Lots of great information! Kelly, you are a master of Social Media. I wish there were the amount of users on G+ at that point there would be no contest in my mind. Facebook's arbitrary decisions on who sees my posts and the glitchiness of their interface as of late make them seriously unappealing in my mind. Maybe we can sway the masses. Great information as always Kelly! In fact no matter if someone doesn't be aware of then its up to other visitors that they will help, so here it occurs.